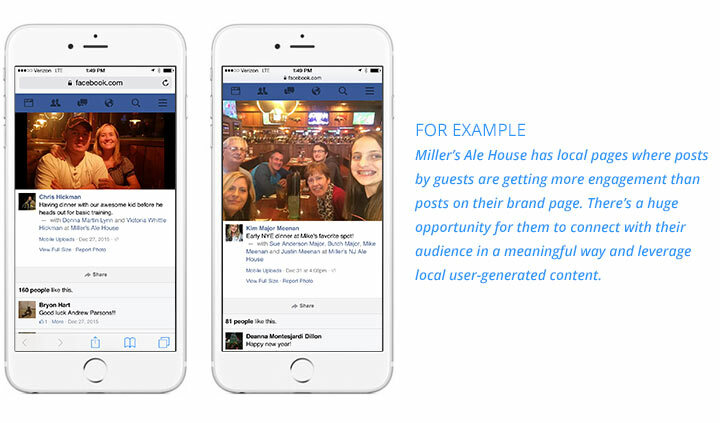 Local social media pages and local content are becoming increasingly important. When people conduct a search for a restaurant or bar on their phone, they’ll likely be prompted to search for one “near me” or they’ll see the closest location as the first result, meaning that they often engage first with a local listing rather than a brand presence. The organic reach of corporate brands’ Facebook posts has continued to decrease. Local business page posts, however, reach a larger percentage of their audience and have higher engagement. If you’re not familiar with local pages, any brand that has brick-and-mortar locations has local pages on Facebook, Google, Yelp, etc. These pages may not be active and may not have been set up by the brand. If guests go to “check in” at a location and a page doesn’t exist for that location, the guest can create one. If a guest creates a page, the brand has no control over what’s on the page until they claim it. Brands that don’t claim their pages run the risk of pages containing inaccurate and misleading information. Brands that claim local pages have the benefit of being able to share more locally relevant content in addition to their brand-level content. Consumers increasingly expect to be able to customize food and beverages: Chipotle and Subway with their assembly lines, Coca-Cola Freestyle or Pepsi Spire machines, big selections of locally brewed beer and craft cocktails. Content is no different. Content that feels more personal is more likely to capture their attention, and they’ll be more likely to share. There’s a lot of noise in users’ social media feeds, and it takes impactful content for brands to break through. For example, football fans notice when a brand speaks directly to their specific fan base. Not all brands have the $$$ to sponsor NFL teams, but Papa John’s does, and they publish content about local teams to their local pages. Local content should also be important to brands that serve alcohol. Growing up in Massachusetts, I never heard the term “happy hour” because apparently a law prevents such a thing. When I moved to Dallas, we didn’t even consider restaurants that didn’t promote a happy hour. Why does that matter? That type of pricing and promotion can vary wildly from region to region for multi-unit brands. For example, a restaurant group may have over 20 different versions of a 2 for $20 menu. Some locations have 2 for $25 or $26, with food varying by location. To accurately promote such a deal nationwide, it could take thousands of geo-targeted ads and much versioning of creative messaging. If local users can’t find this type of information and find out what’s relevant at the location they’re interested in, they’ll move on to the next option. It can sound overwhelming and It may involve a spreadsheet or two, but it is effective and absolutely worth the effort. Want to know more? Give us a shout. This post was created in partnership with content agency NATIVE. Stellar Digital and NATIVE partner to fuel brands fire through strategy, creative and experiences. The constant evolution of the search engine landscape can be difficult for multi-unit brands who are juggling the online presence of many locations in addition to their brand. Whether they’re aware or not, each of their locations likely has a Facebook page, Google page, Yelp page, etc. Google and Yelp pages are crowd-sourced meaning anyone on the internet could potentially go change the information on their pages. With mobile search growing and the prompt to search “near me” these local crowd-sourced pages are often prominent in search results making the ability to control what consumers see in organic search results, well, uncontrollable. A recent survey found that 90% of mobile users’ searches on their phone are for restaurants. 82% of those surveyed want to see an address or driving directions clearly visible in the search results. When a multi-unit restaurant brand’s website shows up in search results it often takes a few clicks to get to specific location information and driving directions. Often, Google and Yelp local page results show up before the brand’s owned properties, clearly displaying an address or one-click driving directions. The information on these crowd-sourced pages isn’t always accurate. Organic search results will more frequently show the most relevant results near the searcher, so it’s important that multi-unit brands think of their locations as local businesses. To illustrate the relevance of local pages, we took 100 multi-unit restaurant brands and conducted searches for them on Chrome desktop, iOS Safari, and the mobile Google app. Maintaining the accuracy of local results can be difficult for any brand, and exponentially so for multi-unit brands. Fortunately, this challenge is solvable. Run a few searches yourself. Let us know what you find and if you’re happy with the results. I was recently in NYC with a coworker. We were trying to get to Applebee’s on 50th and Broadway, which I had been to many times. I could tell that the Uber driver wasn’t going the right way and told my coworker that something was wrong. We arrived at the address the Uber driver was given and there was no Applebee’s, lots of other restaurants but no Applebee’s. I asked my coworker what address he gave the driver and he showed me his phone. The address he’d shown the driver was from the first search result; a Yelp listing that was incorrect. In our case we knew the Applebee’s existed and rerouted the driver. Had we not recently been to that Applebee’s, we probably would’ve thought it was gone and have gone to one of the many other restaurants in the area. More than 50% of Google searches are done on mobile devices. This makes local online properties increasingly important. Even when searching on a desktop or tablet, we’re more and more frequently given the option to search “near me.” With mobile search, the first three organic search results get more than 64% of clicks. For brick and mortar locations, those results tend to be Google business pages, Yelp or Facebook pages. Consumers aren’t thinking about the fact that information like address, phone number and hours of operation are crowd sourced on Yelp and Google pages. Consumers still “check-in” and if they can’t find a location’s page, they’ll create one often resulting in duplicate pages with misinformation. Brands can claim or verify their pages and try to maintain them. This is a challenge for multi unit brands like Applebee’s with nearly 2000 locations. 56% of smartphone searches while on the go have local intent. Google and Facebook have both made recent announcements that emphasize the importance of local business pages. This trend will continue as consumers expect more locally relevant search results. Use a platform like MomentFeed, Social Strategy 1, Brandify, Venue Labs or Location3 to manage your location information. These tools can help you consolidate duplicate pages, and ensure your information such as address, phone number, and hours of operation are correct. Some give you the ability to publish or run ads locally. Some of them let you manage reviews from the platform. 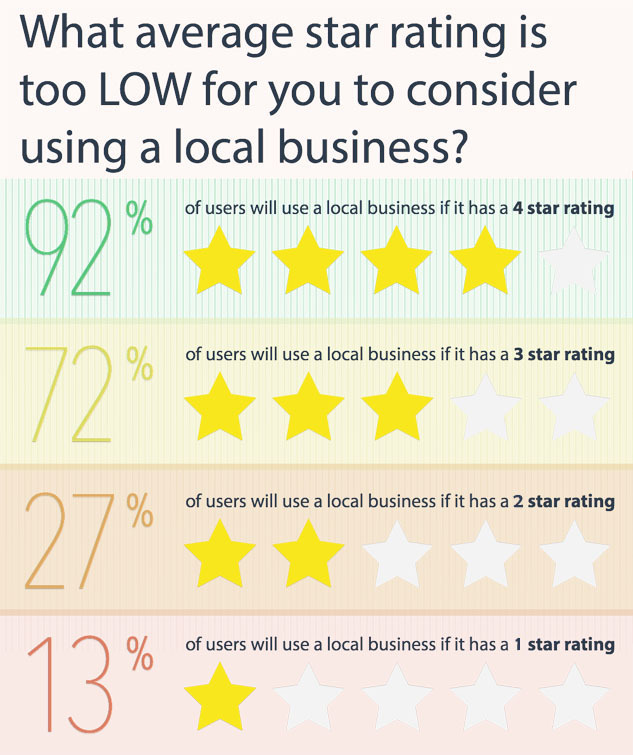 A survey conducted by BrightLocal found that 72% of those surveyed are likely to use a business with a 3 star rating while only 27% would use a business with a 2 star rating. That’s a huge difference! You’ll notice in local search results that the first three locations rarely have less than four stars. Locations with better ratings rank higher. Ratings and reviews not only encourage or deter guests but they also impact search ranking. Encourage guests to leave reviews and pay attention to them. By encouraging guests to leave reviews they’re more likely to tell you if they had a bad experience while still at your location. This gives you the opportunity to correct the situation before they complain on a review site. Educate franchisees and local managers that online properties have an impact on the success of their physical locations. You can manage pages at the brand level through one of the platforms I’ve mentioned or you can empower franchisees or local managers to manage them. Either way, they need to be aware of what bad reviews and misinformation are doing to their reputation and ability to be found in search results. What I’ve been describing is pull marketing. It’s unobtrusive and doesn’t turn consumers off like some advertising can. If a consumer is looking for what it is you offer and you’re not in their search results someone else will get their business. Things change quickly on the Internet. 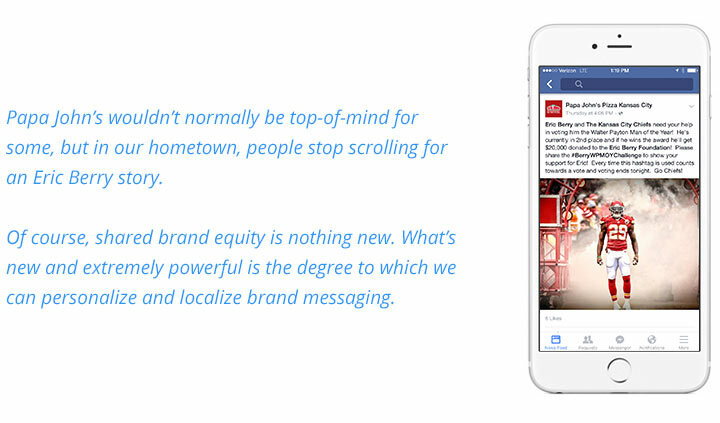 One trend that is not likely to go away any time soon is the importance of mobile and localization. This week I had the opportunity to attend and present at AG Catalyst. I was included because of my restaurant/foodservice background but I knew little about the agriculture industry or the challenges they faced prior to attending. Here’s what I did know. I grew up in one of the oldest fishing ports in the US, Gloucester, Massachusetts. Years of overfishing those waters caused the National Oceanic and Atmospheric Administration (NOAA) to issue restrictions. The fishing industry that sustained Gloucester and surrounding areas for hundreds of years was drastically changing leaving many out of jobs at the same time the US economy was in crisis. The families that relied on this trade for generations felt a seemingly sudden impact. As you can imagine they were not pleased with NOAA and staged protests outside of the NOAA offices. They wrote letters to news publications, went on the evening news in protest, and made the disappointment and anguish in their voices heard. Their livelihood was being taken away and that was the only way they knew to deal with it. 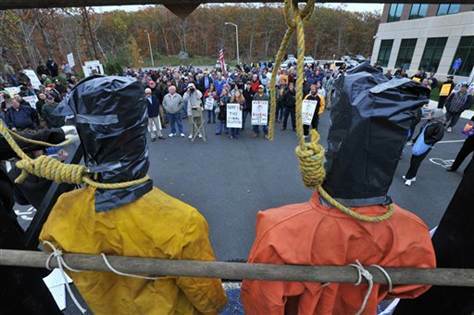 Mannequins dressed in fishing gear with nooses around their necks decorate the stage as hundreds of fishermen rally against new fishing regulations outside the National Oceanic and Atmospheric Administration building in Gloucester, Mass. I arrived early to the AG Catalyst conference and spent some time in the hotel lobby before it started. Lindsay Sankey was sitting nearby talking about the panel discussion she would be part of. I was impressed that her blog proactively addressed issues that farmers are dealing with by explaining the why behind the what. Putting herself in that position could draw a lot of criticism or negativity and she immediately gained my respect for doing it. Reading her blog Jean’s Boots are Made for Talking, backed up my first impression. Sidenote: There were so many great presenters that this post would be way too long if I included them all. If you’re reading this and I haven’t mentioned you, I think you’re wonderful also. Andrew Campbell gave me my next wow! moment. He grew up on a dairy and crop farm, left to pursue a career behind a news desk but returned to work on the farm he grew up on. Andrew uses his media experience off of the farm to educate and advocate around agriculture, breaking down perceptions through transparency. 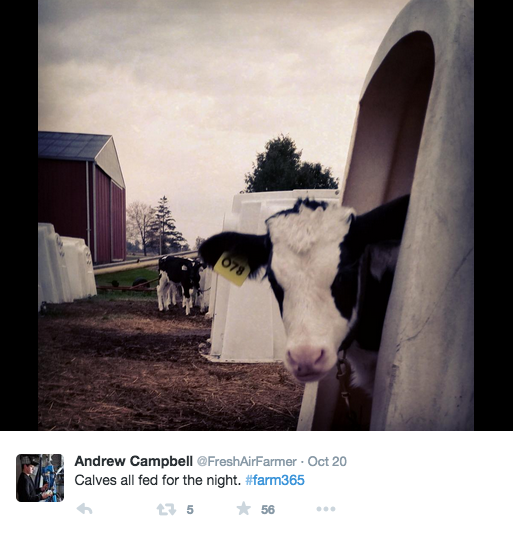 In the spirit of education and transparency, Andrew made a decision that for a year, he was going to post a photo from his farm on Twitter everyday using the hashtag #farm365. Haters gonna hate… and they did. The hashtag was flooded with messages of hate and accusations around treatment of animals that couldn’t be farther from the truth. No matter how hard you try to remove yourself from this, it can feel personal. In his case the haters began sending disturbing messages to his wife, which were personal. There are some groups on the internet that you just have to ignore. Nothing you can say will change the way they’ve decided to perceive you. Andrew learned this lesson, as many of us have. Andrew focused again on his goal of posting a photo from the farm everyday. His photos show how well animals are treated on his farm. He shows how hard farmers work to put the food we have on our tables. Andrew is proactively doing whatever he can to sustain the agriculture industry. AG Catalyst was one of Greg Peterson’s 95 speaking events in 2015. Greg and his family are 5th generation farmers primarily raising beef cattle on their farm in Assaria, Kansas. Greg is 24 but you’d never know it by how he carried himself and the confidence he had on stage singing along live with parody videos he and his brothers made “I’m Farming and I Grow It,” and Katy Perry’s Roar “Chore.” Their videos generated national and international news coverage. Greg is a farmer that is traveling the world advocating for agriculture. He and his family also blog about misunderstood topics in agriculture and open up their farm for tours. What I found remarkable was that the advocates I’m speaking of were young and passionate about preserving their ability to put food on our tables. They are proactive about sustaining their industry and working together to amplify their voice. Unfortunate situations like that of our Gloucester fishermen have inspired a new generation to do better.